Co-Host Joe Zettelmaier shares his thoughts about the newest episode of Constantine! Hello, all! Gravelly-voiced Joe Zettelmaier here, thrilled to be back in the land of flesh-fruit, satanic vinyls and cops-soon-to-be-Spectres. While my recent illness may have turned my voice into a rumbling demon, it hasn’t hindered my ability to write at all, so here we are…back to the Devil You Know Blogs! So one of the things we really got from The Saint of Last Resorts, Pt. 2 is a chance to see the whole gang (plus Anne-Marie) functioning as a team or, to use a phrase often utilized for supernatural “heroes” in a bunch, a Scooby Gang! Outside the popular animated show featuring a sleuthy canine and his human pals, the term “Scooby Gang” was also a popular term to use for Buffy Summers and her gang of monster-hunting companions. I feel like it certainly applies to Constantine, Zed, Chas and occasionally Manny and Anne-Marie. One of the things that has sometimes rankled me about the show is the lack of “team.” For a while, it seemed that Zed and Chas were contractually obligated to only appear in 1/2 of the episodes. One of the things I loved about this episode was watching the team work together. For a fleeting moment, I even hoped to see Anne-Marie join in full-time! (I’m holding said hope for Season 2). Each member of Constantine’s back-up group have special skills not shared by any of the others…psychic visions, spontaneous resurrection, being an Angel, etc. 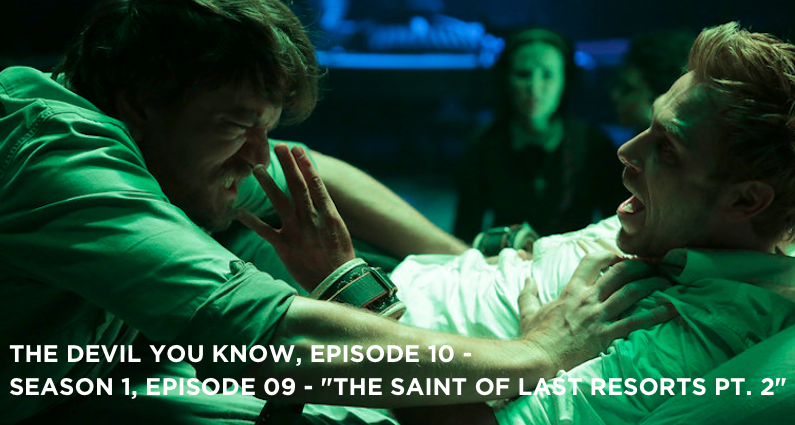 In this last episode, we saw John facing his greatest challenge to date: Self-exorcism. This fate was brought on, as Manny so kindly pointed out, because John refuses to put his faith in others. BUT his salvation came from outside; when all the cards were down, John’s pals risked life and limb (and broken necks) to save him. This is why I love Scooby Gangs. If they’re done right, they don’t actually detract from their protagonist at all. They strengthen them. A protagonist with limitations is a human one, someone we can understand and sympathize with. And in our hardest moments, oftentimes our friends are the ones to get us out of them. When your darkest moments are as dark as John’s are, you need friends who can really bring something extra to the table. Go to NBC and leave them feedback on Constantine, let them know you want a Season 2! Go to the GSM Feedback page, and leave us feedback!